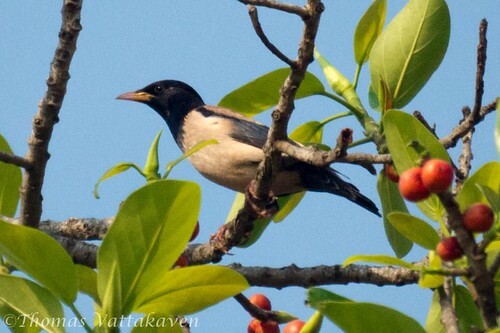 The Rosy Starling (Sturnus roseus), or Rose-coloured Starling, was earlier called the Rosy Pastor and given its own genus. 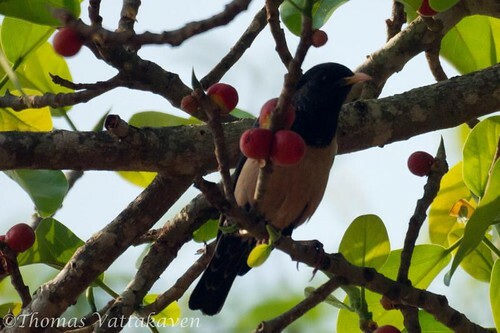 It is a handsome bird, with a rose-pink body, black head, wings and tail. In the breeding season the male has a distinctive crest formed from elongated head feathers that is more prominent when the bird gets excited. 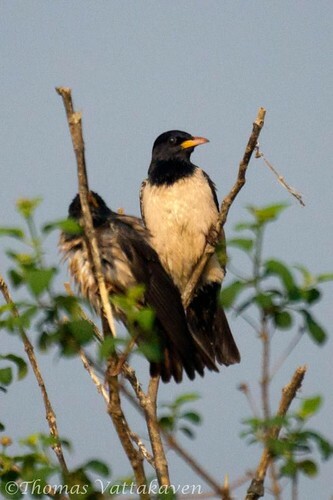 The crest is shorter in winter and the black areas have paler feather edges, making the winter plumage rather dull. Sexes alike but the female is duller and has a shorter crest. 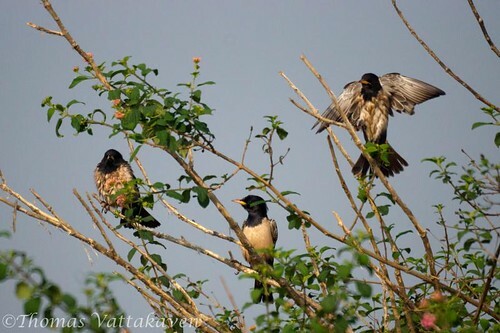 The Rosy Starling resembles the common starling in its habits and is often found in large flocks, feeding on the ground or in trees. 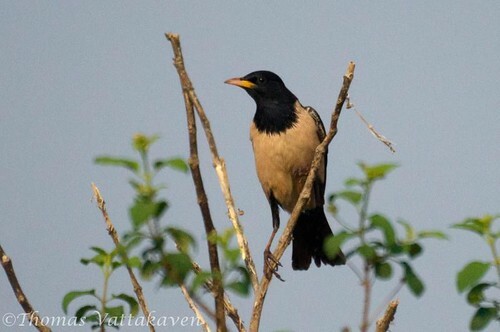 In India, it is a winter migrant and is distributed widely. It breeds in south-eastern Europe. 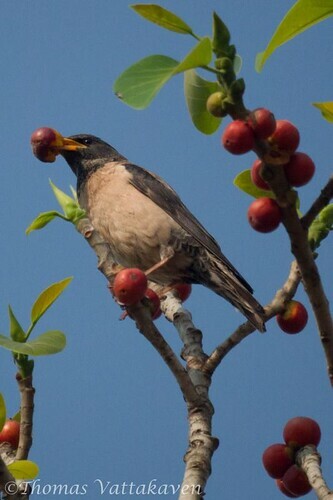 Thus it is absent as a species during its breeding season in India. It feeds on fruit and berries, grubs, insects, grasshoppers, and locusts. It occurs in every type of open country but cultivated and grassy lands are preferred. They mostly feed on the ground (initially). with them but not forming common flocks. 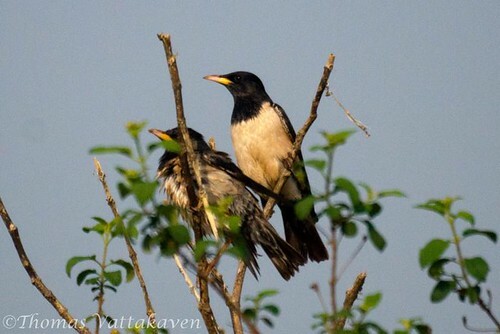 On arrival in India, most birds are still a dull brown in colour that is their juvenile plumage. 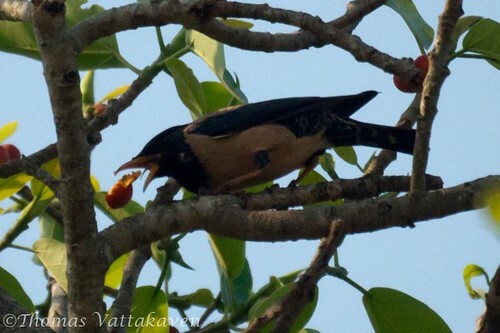 From March onwards, they begin to be affected by the approach of the breeding season and they take to feeding in trees and become very fat in preparation for migration. The breeding season in Europe and parts of Asia is from May to June, where they breed in large numbers on rocky ground or in ruins.